Eleonora! We are so excited to be speaking with you today about your non profit - Ode to the Moon. Can you give us a glimpse of what Ode to the Moon is about? Ode to the Moon is a non profit foundation that uses yoga, art and music to bring awareness to the topic of domestic violence. Practicing yoga according to the moon cycle, connects us to the cycle of darkness and light, life and death, strength and surrender. Being inspired by this concept I created a supportive yoga practice, with live music focused on nurturing creativity and empowering the Goddess within. I believe that music and movements together act as a catalyst for newness and ultimately helps us strengthen both body and soul. Our goal is to inspire people to step up, get involved, and cultivate compassion for those suffering in silence. We give victims a voice that will be heard, offer a clear path to reach out for assistance and wash away the shame often attached to this issue. What was your motivation behind creating this foundation? I personally experienced the overbearing effects that an abusive relationship can have on you, on a physical and emotional level. It took me a lot of time and work to get better, to learn what love really is, how to love and respect myself and how to take control of my life. I wanted to create an environment where together we can raise our voices against violence, where we can sing our song and say no to it, where we can use our body to dance the symphony of life. The life we deserve. I created this foundation because it was time for me to give back. To use what saved me (yoga, art and music) to help others. Empower them, make them feel safe and understood and hopefully guide them through their darkest time into a life filled with beauty and love. How long has Ode to the Moon existed? Ode to the Moon started in 2014, as a series of yoga community events with live music performed by soul singer Allison La Rochelle held every new moon in a local studio, so once a month. Little did I know back then how much people would participate and care. I received so much love and support not only from Monmouth County, NJ but from people all over the world. We travelled all over, in different studios and communities. Since the first event we have been featured in all the major yoga magazines in USA, U>K> and Italy. Slowly we continued to grow until this year we officially became a non profit foundation with the mission to empower individuals who are in need of finding a voice to break their silence. Why do you believe body movement, yoga, visual artists and musicians help breaks the silence about domestic violence? 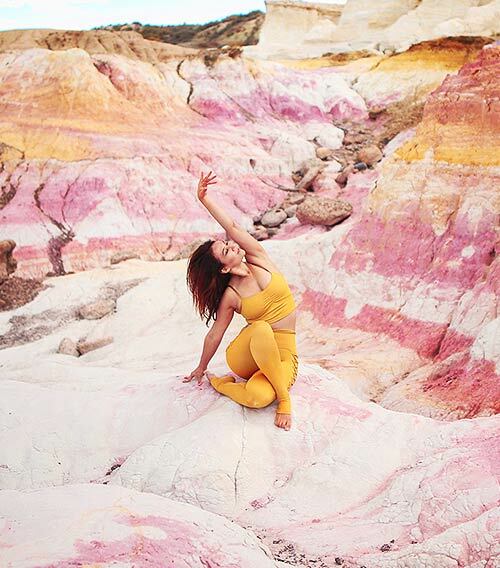 When we breathe, dance, lay in silence on our mat or when we travel from one pose to another during our practice, we let go of all boundaries our mind stores in our muscles and joints. In the most innocent and genuine way we bare our soul to the world. We become present without hiding anything about ourselves. We express all the feelings that we normally repress and we share our raw truth with no shame or fear. In those instances, between an inhale and an exhale, we finally become who we are supposed to be. Alive and vibrant: a poetry in motion, the highest form of living art. In yoga, a pose is not just an act performed by the body, but it becomes instead the physical shape of our soul- an ethereal expression of the self. Is in this connection between skin, bones and Spirit, there lies the sublime healing power of this yoga and is only in the eternal motion of life that we can find true stillness, we realize that we are whole with body and soul. It is in that wholeness that we can find all the answers we are searching for. What is your future vision of Ode to the Moon? I want to keep touching different communities all over the world. Our goal is to be able to create a local ( Monmouth County, NJ) yoga program free for all of those in need, create an online platform, a collective space where we can find yoga classes and reading material to help the healing process of all of those in need: an online community where we can all connect and share experiences. We would love to keep working with different artists to create ART because we believe in cathartic and healing power of art and music as well. Tell us about the events that you do with your foundation, is there one that has stood out to you? We have had many different events and each one of them touched my heart in a very deep way. The first time I heard Allison La ROchelle the official singer of Ode to the Moon, voice. I was leading the first Ode to the Moon class we did together and I have never heard her perform. When she started to sing I broke in tears. Her voice woke up something within my soul that was wrapped in there for so long and it was so powerful for me to cry while teaching a class. To show for the first time my true vulnerability to all the students present in that room. Another moment is when Allison performed for the first time the song “lay your hands on me”, a piece she wrote after I opened up to her, after I told her my story. I was always afraid of judgment therefore I never shared my experience before Ode to the Moon. When Allison sang the song I fell apart and everybody in that room were there for me, nobody judged, back then I understood that I was not alone, I never was. Is there that I understood how important it is to talk and share in order to really heal. Recently I started to collaborate with a local Teacher and friend Jodi Kobrin and thank her we incorporated Aerial yoga in our events, I have never tried Aerial before and I practiced the first time during one of the events and I understood there, while hanging in the hammock, with Allison singing and Jodi leading the practice how beautiful it is to surrender. To trust. To let go. To let somebody else guide you, help you, support you. Every event has something special I could share. In every one of them I discover something about myself that I did not know existed. Every time I become stronger, lighter and more determined to keep working on my project. Keep fighting against domestic violence. Get in touch, share your ideas and opinions. Donate if you can, host Ode to the Moon events if they own a studio or if they want to organize an event involving us. We want to get into Universities and High Schools as well so invite us to talk in those facilities. Participate in the events if they are local but more than everything help start a conversation on the topic by commenting on IG and sharing you love and support to the foundation. Any artists who would like to collaborate with us ( yoga athletic wear, photography, designer, videographers) is more then welcome to contact us and share their projects and ideas as well. This might sound a little “strong” but I am. I was able to survive and not only that, I was able to turn something negative and destructive in something beautiful: love for myself and for others. So also if on a daily basis I am inspired by my sister, my friends Kim, Cassandra, Jodi and Aaron, my boyfriend, my teacher Irene and all my students, I became strong enough to remember to rely on me. I choose to be proud of myself, to love myself in a way that will always give me the strength to love other in the most genuine and pure way I can. I sent this questions to some of my dearest friends, just to have a”little help” and apparently what they all agree with is the word HILARIOUS. So I guess I am quite funny! I give a lot, I love a lot and I am always there for those I love. I believe friendship is a gift to honor and something to be really grateful for in every given moment. What advice do you have for women wanting to make a difference? Believe in YOURSELF. Be bold, Be brave, fall in love with yourself over and over again. Do not be afraid, do not be ashamed of being who you are. I believe in you. BE YOUR OWN INSPIRATION. Shop Luna Mat to Support!